New British all-premium-class airline Silverjet has its own private terminal at Luton Airport (about 40 miles north of London) that reduces advance check-in time to 30 minutes. Like other new all-premium-class airlines flying between New York and London, Silverjet's fares are far cheaper than the full business-class fares charged by network carriers such as British Airways and Virgin Atlantic. BritishAirways' and Virgin Atlantic Airways' flexible roundtrip Business Class fare between New York and London now tops $10,300 roundtrip, including taxes and fees. Despitethis all-time-high fare price, the International Air Transport Association saysnearly 700,000 travelers bought premium-class tickets to travel between the United States and Europe in May. Thankfullyfor the more than 4 million economy fliers who will cross the Atlantic eachmonth this summer, there is an increasing number of ways to traveltransatlantic in comfort for very much less. At $800roundtrip, Zoom Airlines' Premium Economyclass between JFK and Gatwick has a standard Economy seat with an extra 5inches of legroom, free drinks, and priority boarding and baggage delivery. BritishAirways and Virgin Atlantic offer Premium Economy classes between JFK and Newark to Heathrow from $1,200 roundtrip. Although both cabins offer wider seats, extrarecline and 7 inches more legroom than economy class, Virgin is in many wayscloser to business class than BA with a 3-inch-wider seat and nice touches likewelcome-aboard champagne, meals on china, after-dinner liqueurs and dedicatedflight attendants. Betterstill, a spate of airline start-ups with all-premium-seat planes has trimmed theprice of flying business class between New York and London, using secondaryairports north and east of the UK capital. MAXjet?sfully-flexible round-trip fare between JFK and Stansted is $3,500, but bookahead and you?ll cut this in half and enjoy sleeper seats and in-flight servicethat is superior to premium economy. 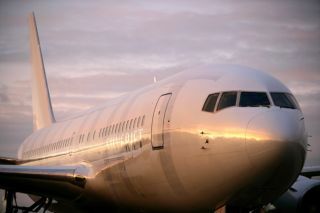 Flying from Newark, Silverjet has its own private terminalat Luton airport that reduces advance check-in time to a mere 30 minutes. Onboard, it swanksseats that recline to 6-foot-3-inch flat beds, women?s only bathrooms, and sleepzones with dimmed lights and no announcements.? Roundtrip flexible fares of $3,800fall to $2,500 when booked ahead -- and for August travel, you can even bid fora round-trip from $600 at www.skyauction.com! With just48 seats on each plane, Eos pampers passengers even more with 6-foot-6-inch bedsand gourmet meals. Fully flexible fares between JFK and Stansted are higher thanMAXjet or Silverjet at $8,300, but drop to $3,800 with advance purchase. Finally, numberone for lasting value and complete flexibility is Delta?s Global Business Pass. Availableto Bermudian and European-based businesses and organizations, travelers can flyDelta between any North American city and the UK or 11 other European countriesat fixed, inflation-proof fares (except taxes and fees) for the next 5 yearsuntil 2013. Forexample, roundtrip Business Class fares between JFK and Gatwick (and Heathrowfrom April 2008) are $4,100 when booked 2 weeks in advance, and $5,440 whenbooked within two weeks of travel. These prices include all fees. Tickets areflexible, fully refundable and earn mileage credits in Delta?s frequent flyerprogram.